Fresh eggplant gets breaded and fried, then baked under a layer of sauce and cheeses for the best fried eggplant parmesan recipe. 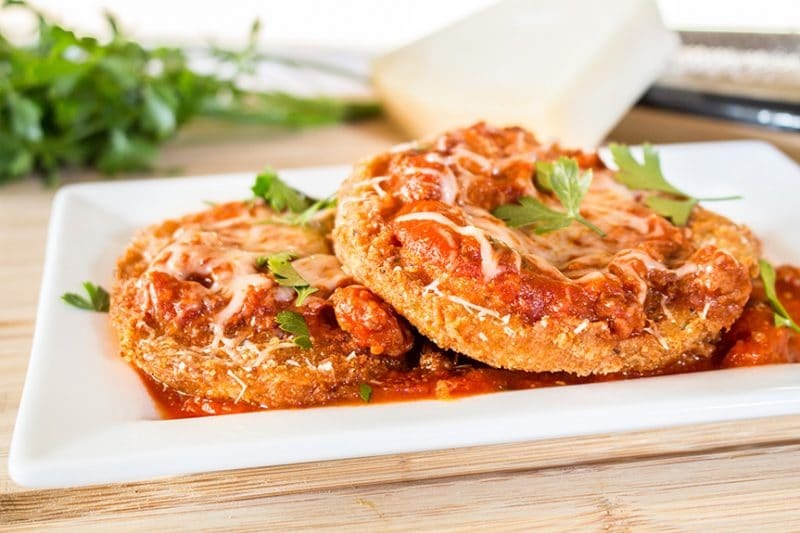 Eggplant Parmesan is the perfect marriage of summertime eggplants and Versatile Meat Sauce. This can also be made with jarred pasta sauce, and Lord knows I have used jarred sauce before when I was too lazy or busy to make homemade. No really, lazy is the better reason. One trick I learned long ago, and even use with homemade sauce is to add a 15 ounce can of tomato sauce to extend and pasta sauce you are using. Unless you are mixing it with less than 16 ounces of pasta sauce, you should not notice a huge difference in taste. I like how it thins out the sauce for this recipe, as I don’t care for a big stiff glop of sauce on my eggplant or chicken Parm. Eggplant may seem kind of intimidating, and I confess I was intimidated the first time I ever took a knife to one. Now, I have never ventured outside my box on eggplant, I only use it for a fried version of eggplant Parm. Chicken can be substituted for eggplant in this recipe, as the breading and cooking techniques are the same. Fresh grated or shredded Parmesan cheese is what I use now, but the big green can of grated cheese is suitable for use, as well as the shredded stuff you buy in a plastic container or package in the cheese section of your local MegaloMart. Fresh mozzarella can also be used, but I prefer the finely shredded kind you find in a bag, near the shredded Parmesan. I have also used the Italian blend shredded cheese. Really, it’s OK to use whatever cheese you like best. If you want a gluten-free version, skip the flour and bread crumbs and use Rice Chex that have been run through the food processor or blender until fine and add dried parsley and grated Parmesan cheese. Use this blend for both the flour and bread crumbs in the attached recipe. This blend is also a suitable substitute for the bread crumbs in meatloaf and meatballs. 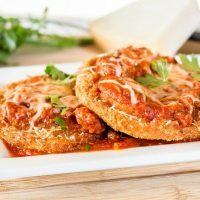 Battered and fried eggplant slices, covered with pasta sauce and cheese. In a large bowl, combine flour, breadcrumbs, and Adobo Seasoning. Peel eggplant and slice into 1/2 to 1-inch slices. Immediately coat eggplant slices with bread crumb mixture to avoid browning. In a small bowl, whisk eggs with ½ cup of water. Set aside. Dip 1 eggplant slice at a time into the egg wash, covering both sides. Place eggplant slice back into bread crumb mixture and make sure it is completely coated with breadcrumb mixture. Set aside. Coat al eggplant slices as above. In a large skillet, add enough oil to the pan so the eggplant slices will not touch the bottom of the pan. heat oil over medium-high heat until oil sizzles when you drop in a little of the breadcrumb mixture. Once the oil is heated, add as many eggplant slices as will fit in the plan, leaving a little room between slices. Cook until the first side is golden brown, carefully flip over and cook the other side. When done, remove to paper towels for draining excess oil. When all eggplant slices are cooked, move them to the prepared baking sheet. Cover each slice with 1 to 2 tablespoons of sauce. Cover sauce with shredded mozzarella, as much or as little as you prefer. Cover mozzarella with a parmesan cheese, as much or as little as you prefer. Place in preheated oven and bake until cheese is melted. Serve immediately with more sauce if desired. Calorie count assumes 1/2 teaspoon of flour and 1/2 teaspoon of bread crumbs remain on eggplant slices, and 1/2 teaspoon oil remains after frying. All of these things are variable depending on cook, oil temperature. Type of pasta sauce and amount used will greatly affect the calorie count.